Red poppy flowers done in watercolor designs on baby shower invitations make for a super cute, trendy, and totally on fleek theme for the momma-to-be's special day. They're pretty, informational and extremely stylish. Although, flowers might make some people think of girls, we think the unisex red and green theme that runs through these sweet invitations can be used for either a girl OR a boy. First up is the top seller (as of this post) at Zazzle. It features a garden filled with pretty poppies and all of your personalized information on the front with the cutest green and white polka dot pattern on the back. Poppies symbolize peace and looking at this gorgeous red poppy wreath design we can see why. The stylish fonts add to the look and we love the way it coordinates with the green and white pattern on the back. The watercolor poppy flower border (and pattern on the back) on this baby shower invite is simply stunning. We can see why the designer named it "Beautiful". The simplicity of this design featuring a single red poppy in a mason jar goes a long way towards making this one of our very favorites. We think the black background on this custom baby shower invitation gives it a sophisticated look. If you're looking for a more elegant baby shower invite, this would be the one for you. And last, but certainly not least when it's this pretty, we're featuring a red poppy baby shower invitation where the watercolor poppies look like they're growing wild in the meadow. Stunning! These can absolutely be used year round but they'd be especially perfect for a spring or summer shower. Each of our featured designs were created by the shopkeepers who sell their art at Zazzle.com. They are individually priced and many of them can be customized for size, paper type, and shape. Your choices will determine the cost. Personalizing is always free and your satisfaction is guaranteed 100%. Co-ed, or couples baby showers, are growing in popularity. In all honesty, why should the daddy-to-be be left out of this important event in the life of his child? If you're planning to go big for their couples baby shower, these Baby Bash Invitations are the perfect way to get that party started. Friends and family will marvel at the faux gold glitter that covers the back and part of the lettering on these super special invites. The front shares all of your shower information written in a variety of fun fonts set against a white background. They can be used for either a baby boy or girl. Brought to you from Zazzle, a world leader in custom and personalized paper goods and other gift items. These invitations were created with love by a designer who keeps shop there. You can order as many, or as few as you need, as shown or customize these amazing invites for size, shape, and even paper type. Your low cost will be determined by your choices. Personalizing never costs anything extra. All invitations come complete with a standard white envelope and Zazzle's 100% satisfaction guarantee. This custom and personalized bridal luncheon invitation features gorgeous hand drawn watercolor pink peonies. It's perfect for the spring bride! The stunning hand painted illustration contains several shades of pastel pink flowers with green leaves set against a white background. Your party information is easy to add using the template. Feel free to customize for size, shape and paper type. Your choices will determine the low pricing of these amazing invites that are sure to please the bride-to-be as well as her intended guests. The chic all pink flip side makes sure that all of the attention is given to the front placing the party particulars in full view. Send soft fluffy clouds, the moon, and the stars to invite guests to honor the mother-to-be and the new baby that will be loved to the moon and back. The watercolor image on the front of these Sweet Dreams baby shower invitations beautifully surrounds your personalized party information. This post contains affiliate links. If you purchase something after clicking one, I will earn a small royalty which costs you absolutely nothing. Thanks for your support! Even though the clouds are pastel shades of blue, we think this design would work fine for either a girl or a boy but if you prefer to be more gender specific, the sweet Sweet Dreams baby shower invitation is also available with pink clouds. Customize these amazing invites for size, shape, and paper type. Your choices will determine the cost. Each invitation comes complete with a standard white envelope and Zazzle's 100% satisfaction guarantee. See more of our hand-picked favorite baby shower invitations. I think these are just about the cutest jungle animal baby shower invitations I've ever seen! ​Let this adorable lion, giraffe, elephant, and monkey quartet lead the way to your Sweet Safari baby shower. These are non-gender specific so they can be used for either a boy or girl. In addition to the cute animals there's also some greenery, a pink heart and draping flowers surrounding the fun script and block lettering that share's all of your party information. This design is perfect for a jungle or animal theme baby shower but can also be used if the parents-to-be love animals or are looking to decorate the baby's room with an animal theme. Customize these cuties for size, shape, and even paper type. Your choices will determine the cost. Each invite comes complete with a white envelope for mailing and Zazzle's 100% satisfaction guarantee. Shower the bride with wine tasting bridal shower invitations, featuring a bottle of rosé, a pair of wine glasses, and "cheers to love" in block and script typography. The design is perfectly pretty in pink with a beautiful pattern on the back. and comes complete with a standard envelope. Easy to personalize by adding all of the bridal shower details using the template fields provided. You can also personalize the wine bottle with the couple's initials. This one is a perfect choice for bridal showers in wine country, or for a winery theme or vineyard setting bridal shower. Customize for size, shape and paper type. Your cost will be determined by your choices. Although these gorgeous floral pumpkin bridal shower invitations can be used at any time during the Fall, we think they'd be especially nice for the bride-to-be who is being honored on or near Thanksgiving time. The invite features a watercolor image of a pumpkin overflowing with a beautiful floral arrangement in autumn colors of purple, orange, white, and green. We love the way it's being presented with the clipped corners but feel free to customize these invitations for size, shape, and paper type. Order as many or as few as you need. Each one comes complete with a standard white envelope and Zazzle's 100% satisfaction guarantee. With all of the beautiful summer brides getting ready for the big day, it's time to choose those gorgeous summer bridal shower invitations. I went browsing on the Zazzle website this morning and seriously couldn't decide on a favorite design. Trending today, I found that most of the front runners were exquisite watercolor masterpieces. These romantic designs were created using a lot of different floral and botanical varieties including green leafy illustrations, roses, sunflowers and succulents. Without further ado, I'm featuring the top 12 summer bridal shower invitations as chosen by the shoppers at Zazzle. Enjoy! ​And if you see anything you like, click on the image and you'll be taken directly to the Zazzle site where you can learn more and order your brilliant bridal shower invites today! You weren't imagining it, there were actually two different wild meadow designs featured here today. That's because this gorgeous leafy design is super popular right now! All of our designs are brought to you via Zazzle.com, a world leader in custom and personalized paper goods, apparel, and gift items. You'll love their quality and prices. You'll especially love their 100% satisfaction guarantee! The 50's Diner theme is hot for all kinds of parties right now and that includes bridal showers. If you're planning a 1950's theme wedding or bridal shower, take a look at this modern interpretation of a classic fifties style! Seasonal Showers is affiliated with Zazzle, a world leader in personalized paper goods and gift items. If you make a purchase after clicking one of our links, we may make a small royalty from the sale. This never costs you anything extra and we appreciate your support! Read our full disclosure HERE. These big 5" x 7" invites have a fun checkerboard border and retro style fonts that make the typography of the lettering really pop. They're easy to personalize with all of your party information and come complete with a white envelope and Zazzle's 100% satisfaction guarantee. The 50's Diner theme is easy to achieve without a lot of fuss. Plan to serve "diner food" like hot dogs, hamburgers, and milk shakes topped off with a piece of apple pie. Decorate with checkerboard table cloths. ​Play 50's rock and roll music. And ask your guests to come dressed in their 50's finest! These fun bridal shower invitations can also be used if you're not planning a full-blown 50's theme party. They'll work great to gather the gang together to honor the bride-to-be no matter what you're planning to serve. See more of our hand-picked favorite bridal shower invitations! ​3 Different Designs. So cute and unique! OMG! I just came a cross the cutest baby sloth baby shower invitations. So many people are loving these adorable little creatures that it only makes sense to use them as your next baby shower theme. The designer has smartly created 3 different but similar designs so that the invites can be used for a boy baby, a girl baby, or a gender neutral baby shower. One of the designs is autumn specific and incorporates golden yellow and orange leaves into the design. The adorable design features a baby sloth wearing a pretty flower crown hanging from a tree branch. The illustration is framed by greenery, vines, and flowers. This fun invite features the same sloth minus the floral wreath and flowers in the greenery making it perfect for a gender neutral or baby boy's big day! 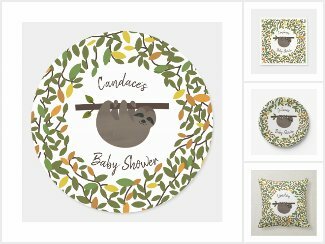 Here's another option for a gender neutral, boy's or girl's baby sloth baby shower which features the cute little sloth only this time, the greenery is starting to change colors for the autumn season. In addition to the baby sloth illustrations, these large 5" x 7" custom and personalized invitations feature trendy fonts and creative lettering. They each come complete with a white envelope and Zazzle's 100% satisfaction guarantee. In addition to the invitations you'll find an entire line of matching personalized party supplies and gift ideas to go with all three of these featured baby sloth baby shower invitations. Click to visit the entire collection of Baby Sloth party supplies and gift ideas.